Below is a great way to have a really פרייליכען פורים, feel great about צדקה, give משלוח מנות, and help the Cheder Chabad of Monsey. Purim is so much fun, with so many easy-to-perform Mitzvos as well! Two parts of the Yom Tov are giving Tzedaka (Matanos L’evyonim) and Mishloach Manos. Cheder Chabad of Monsey is offering two ways to complete these Mitzvos, making it easier to fulfil. For Matanos L’evyonim, we’re offering a donation card. Each family you select will receive one, to let them know that you have honored them with a contribution to Cheder Chabad. The more names you select, the lower the average cost. The first 24 names is at $4 each; for 25 names or more, the fee is $72, (about $3.00 per name); and for the whole (ganze!) list, the fee is $360. An email will be sent to you shortly which contains the username and password that will enable you to log on to www.purimproject.com . If you do not receive it by Wednesday the 11th, please let us know by emailing purim@chedermonsey.org or by calling 845.356.1213 ext 227. For the first time ever, Cheder Chabad of Monsey is offering Mishloach Manos baskets. There are four beautifully designed and assembled Purim baskets, ready for you to pick up. Scrumptious and stylish, they will make both you and your recipient proud. Not only will they will reflect your good taste, but you will also be commended for the contribution you made to the Cheder. And did we mention that the bustle of dreaming up the presentation, plus doing all the purchasing and assembly will also be ours, so you will be free to look to Purim with a light heart? That’s a bonus in and of itself! Interested? 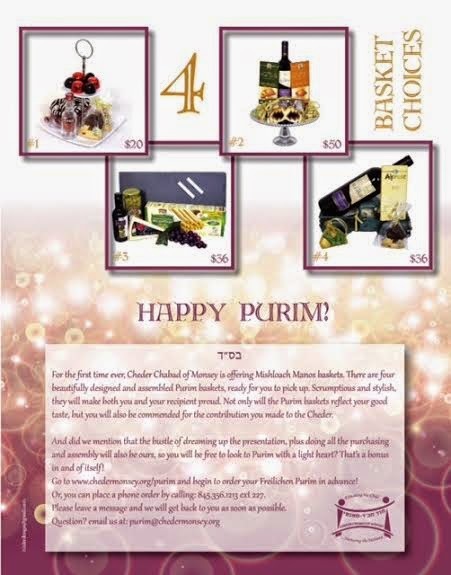 Click here to see choices and begin to order your Freilichen Purim in advance! Or you can place a phone order by calling 845.356.1213 ext 227. Please leave a message and we will get back to as soon as possible. Question? Email us at purim@chedermonsey.org.